This teaser for the upcoming revamp of the Obsidian Twilight-concept from LPJ Design is 12 pages long, 1 page front cover, 2 pages of advertisements, leaving us witha total of 9 pages of content, so what does this pdf constitute? If the ominous name of the world wasn’t ample clue enough – the setting described in Obsidian Apocalypse is anything but a cozy one – 100 years ago, a meteor hit the world, destroying not only large swatches of land and covering the sky in soot, but also carrying vast amounts of negative energy with it, resulting in an undead apocalypse that further diminished the thinned ranks of the survivors. Worse, the resulting ash-cloud carried vast amounts of magically-enhanced plagues and the ice-age-like winter that has all but slain plant-life on the world and plunged it into hunger to accompany disease, with only magic, alchemy and psionics keeping the remaining populace alive, the latter suddenly becoming more pronounced and wide-spread and a glimmer of hope in the otherwise bleak world. Worse, the energies of the meteor have made Abaddon cut off from the planes, making it possible for beings to enter, but not to leave. But even in this desolate vision of endtimes, war rages: Undead mummy-king of the Shaan, Asi Magnor cuts a swathe of order and dominance through the undead lords and remains uncontested for a while – until vampiric lich Calix Sabinus rises to stand against the mummy. The ensuing war was fought bitterly and saw another tragedy – Zebadiah, last angel of Abaddon, sire of the race of exalted, was vanquished by Calix Sabinus, half his body scorched and used as a living battle-standard before being cast away and condemned to an existence as a mere observer. And the worst part is – the triumph of the vampire lich may actually be better for the world – the mummy-lord sought only undead subjugation and slaughter, whereas Calix and his brethren want people to farm them. Editing and formatting are very good, I noticed no significant glitches. Layout adheres to a beautiful two-column full-colour standard and the pdf comes with gorgeous artworks, some of which you might know from Obsidian Twilight, while others, no less gorgeous are new. The pdf has no bookmarks, This all-fluff introduction serves as a comprehensive introduction to the world of Abaddon, more structured and better presented than in the predecessor. 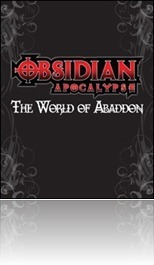 The world of Abaddon is a dark, apocalyptic wasteland and has potential galore – it always had. I’m currently really hoping that the revamp under the banner of “Obsidian Apocalypse” provides us with all the glorious details on cities, currencies, landscapes etc. to make this work as a full-fledged setting. As a teaser and introduction, this pdf does a stellar job to wet one’s taste and is free to boot – lacking complaints, I’ll settle for a final verdict of 5 stars for this.